Night to Dawn Magazine & Books, 9781937769154, 172pp. William Penn never suspected that his beloved Philadelphia would turn into the city of brotherly death. But that's what's happening in Philadelphia and other major cities. And it's only going to get worse. The dead are coming-revenants, vampires, and zombies-people who have scores to settle with the living. So padlock your doors and pack up your guns and survival gear. If the dead passed because their funds, administrators, or heartless caregivers prohibited lifesaving treatment, they will come back seeking revenge. Their anger makes them hungry for flesh. So very hungry. 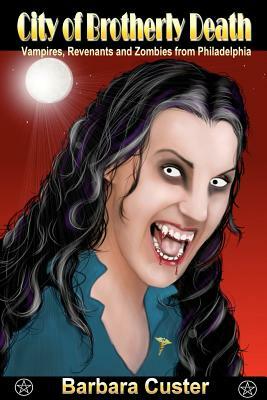 Even vampires won't be immune to the terrors of revenants and zombies. The collection of 13 tales will keep you awake at night and make you wonder if you'll ever be safe again. Since her high school days, Barbara has enjoyed a good scary flick whether it involved traditional monsters or invading aliens. She fantasized about composing such tales, but the writing didn't begin until 1990, when a college professor encouraged her to try writing as a way to grieve over her mother's death. A Stephen King fan, she began with horror fiction, and it enabled her to turn over her grief. Most of her protagonists grieve over deceased parents. Her horror and science fiction short stories have appeared in numerous small press magazines. She later moved on to science fiction and dark fantasy novels to appeal to a wider audience. Night to Dawn published some of her work before the former editor retired. She's been editing the magazine since 2004. Her first novel, Twilight Healer, has gone through three printings. Author Tom Johnson collaborated with Barbara on an anthology, Blood Moons and Nightscapes. The anthology ran for three years. Last year, Tom and Barbara collaborated on Alien Worlds and Starship Invasions, also short stories collections. By the end of this year, she plans to release Steel Rose, a book featuring a young woman whose search for a cure leads her to a romance with a Kryszka alien and a battle against zombies. In most of her tales, Barbara brings her background as a respiratory therapist to the printed page, blending it with supernatural horror. With "Death's Dividend" and "One Last Favor," the political elephant appears in the room that is the health care crisis. Her medical training provided the technology and grist for the written pages in these tales. Alas, she fears that the political elephant will turn into the monster it becomes in these stories if Congress doesn't address it now. In 2008, she began publishing books through the Night to Dawn imprint. Novels by Tom Johnson, Neil Benson, Rod Marsden, and others have gone to print through NTD and many of them enjoyed four-star reviews or better on Amazon. Tom followed up his share of the tales with Pulp Echoes, an anthology of pulp tales, and Cold War Heroes, which details the day to day life of a soldier. Barbara's on Facebook, Linkedin, Twitter, and The Writers Coffeehouse forums. Look for the photos with all the Mylar balloons, and you will find her. Barbara lives in Pennsylvania. When she's not working on my projects, she's shopping for Mylar balloons or enjoying a great fright flick.